Everyone is waiting for Padmaavat as the film encompasses the never seen badass side of Deepika Padukone. We have seen Deepika Padukone is almost all kinds of roles and she galvanized us from all the roles she played. Recently some pictures of Deepika Padukone were added to the internet, in the pictures she is dressed up as a cop. In the photos, she is seen relaxing on the bonnet of a car and she looks like a renegade police officer. People have triggered their fantasies and they are thinking that it may be the part of her new movie project. However, it is not true. 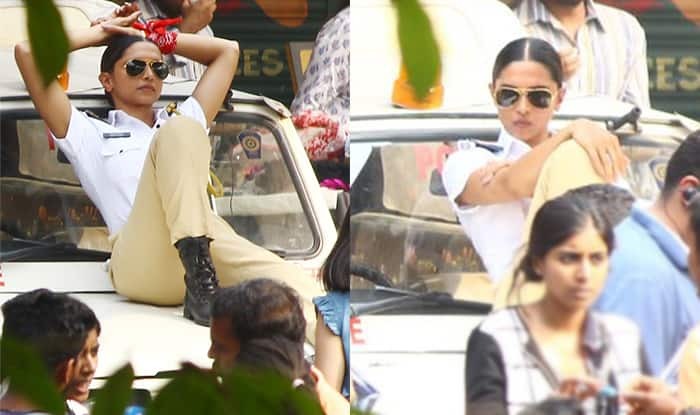 Before you jump to any other conclusion we would like to inform that Deepika impersonated a vigorous cop for a Television commercial. Her bold, cold and calculated looks impressed everyone. We have seen many Bollywood actresses playing a cop in the movies but no one looked as stunning as Deepika does. Every time she impersonates a character she does it with adroitness and she introduces a new level of perfection. The previous year was not in her favor. Her movie, Padmaavat battled against the controversies and now it is all set to hit the theaters. Deepika is playing the role of Rani Padmavati in the movie for which she was threatened to behead and she required police protection. Fortunately, the controversies ended and the film will hit the theaters on 25 January 2018. Seeing Deepika in this look, now we have the desire to see her playing a cop in a movie. Without a doubt, she will nail the role. What do you think? Doesn’t she look stunning in this white shirt and khaki pants? Share your thoughts in the comments. Also, check Jennifer Winget’s debut movie releases on Netflix.